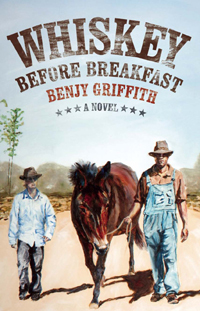 Benjy Griffith’s novel Whiskey before Breakfast is a Southern page-turner, told with humor and an uncanny ear for the Southern idiom. It presents a motley cast of Middle Georgia originals caught up in the struggles of the Great Depression. The principal characters, thirteenyear- old Newt and his friend Jefferson, will remind some readers of Huck Finn and Jim. Both boys have abusive fathers and both deal with challenging situations. While Huck’s answer to most problems is an instantly devised tall tale, Newt, faced with more perilous trials, relies on an innate understanding of what motivates human beings. Newt’s compassion, expressed in his gentle protection of his mentally handicapped younger brother, also sets him apart. Jefferson, who experiences a life-changing moment during a rare visit to church, is also a more complex character than his counterpart, Jim. Standing out among the minor characters is Hap, a comical backwoods entrepreneur. Earl Ham, Newt’s profane, tyrannical father, has two main businesses: a sawmill and moonshine whiskey. He decides to move into rival territory, sending Jefferson, an alcoholic who will work for whiskey, along with Newt, who will sell the moonshine and protect the money. But this is Newt’s story and it is one that will linger with the reader long after the final pages.